This wooden puzzle features a USGS image of your hometown or favorite getaway. 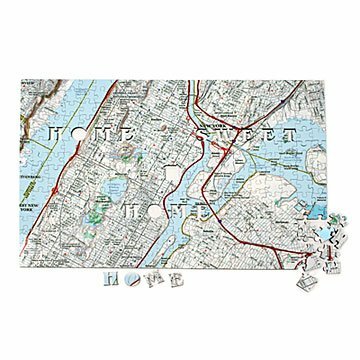 You know your neighborhood like the back of your hand--now prove it with this 300-piece puzzle, featuring a map of your hometown or favorite getaway as the subject. Made of 3mm thick European birch plywood, this jigsaw puzzle covers an area of 4 miles north-to-south and 6 miles east-to-west, resulting in a large map with your house at the center. Taking a page from traditional Victorian craftsmen, there are 15 specially-shaped "whimsy" pieces, such as a piece shaped like a house in the center, where your home is located. This personalized design comes packaged in a plush velvet pouch and book-inspired box, lending handsome appeal as a housewarming gift or coffee table topper. Made in the United Kingdom. This is the only item I've ever purchased from Uncommon Goods that was a disappointment, and a terrible one at that. The puzzle arrived in a beautiful box. The pieces themselves were contained in a plastic bag but a velvet-ish drawstring bag was also included for long-term storage, I guess. The puzzle pieces have an odor of burnt paint or burnt wood or some sort of acrid odor. It faded a bit in 2-3 days but the odor kind of sticks to your fingers. The puzzle itself was sadly inaccurate. A major road that was finished two years ago isn't even on the map. And the whole point of buying the puzzle, that it is centered around your street and your home? LOL! My street wasn't even shown on the map, even though a dirt road about 1/4 mile away from my road made it on the map. Maybe I'll give the puzzle to someone whose street shows on the map and who doesn't care that the map itself is at least two years outdated. I purchased these as gifts. They arrived in a box that looks like a book, when you open it the puzzle pieces are in a nice bag. Pieces are nicely made. It would be nice if a picture of the area was included. The puzzle quality looked good. It was a gift so never saw it assembled. In hindsight this puzzle is probably going to be quite hard because her vacation home is on a lake. Lots of blue! I believe she appreciated the thought tho. I would buy again as a gift. I think the puzzle would be more fun to assemble if its of an area that has a lot going on. It's a wooden map based on your neighborhood, but you could use any specific place that means something to you - St. Stefan's Church in the First District of Vienna or the town park in Adel, Iowa - and it's so much fun. Hilary and Brian were so surprised and wondered how I thought of such a unique gift. Uncommon Goods rocks! Pieces came in a nice storage box and presented nicely. Son and daughter in law loved the puzzle of their new neighborhood. Interesting different kind of gift. Very well made. I purchased this as a gift for my son-in-law for Christmas so I haven't given it to him yet but I was very disappointed when I opened it. It had a bad smell and the back of the puzzle pieces made my hands dirty. I also thought there would have been a picture of the finished puzzle. The box and pouch for the pieces are nice - but it should show what the puzzle looks like. If I could, (its personalized) I would return it.